Wilk et al describes the throwing athletes' predicament by defining The thrower's paradox: The thrower's shoulder must be lax enough to allow excessive external rotation but stable enough to prevent symptomatic humeral head subluxations, thus requiring a delicate balance between mobility and functional stability. This balance is frequently compromised and believed to lead to various types of injuries to the surrounding tissues. Immense stabilization must be utilized by the tissues in these athletes because of the extreme angular velocities and large amount of force that is transmitted through the glenohumeral joint and its surrounding structures. Injuries to the shoulder of a throwing athlete typically present with one or more of the following findings due to the inability to maintain functional stability and/or movement throughout the throwing motion: increased shoulder external rotation PROM, decreased shoulder external rotator strength, osseous adaptations, scapular muscle imbalances, poor posture, change in pitching mechanics and pitching through fatigue. While many sports involve overhead throwing, baseball pitchers compromise a plurality of those throws and over half of the throws made in a baseball game. The wind up phase is defined as the initial movement to maximum knee lift of stride leg. During the initial movements the pitcher brings his or her hands overhead and lowers to chest level. During these simple movements consider the muscles proximally to distally. EMG studies show that the upper trapezius has a maximum voluntary isometric contraction (MVIC) of 18%, serratus anterior 20%, and anterior deltoid 15%. During this phase the muscle activity is quite low and for these reasons risk of injury is low as well. The picture below depicts an overhead view of the alignment of the body during the acceleration phase of throwing. Note the 15 degree angle of the foot away from the center of the mound. The stride ankle also typically lands approximately 10cm away from the same midline with a distance from the rubber averaging 87% of the pitcher's height. Fleisig emphasizes the importance of these values by describing the change in force exhibited on the shoulder when they deviate from the norm. During the cocking phase, Fleisig reports a 3.0N increase in anterior force at the shoulder for every extra cm and a 2.1N increase in anterior force at the shoulder with every degree increase of foot angle. Please note that decreasing the distance away from center or decreasing the angle did not result in increased anterior force on the shoulder. So, because of the increased anterior force on the shoulder, it can be assumed that over time the anterior ligamentous structures to the glenohumeral joint may be compromised. This finding is consistent with the anterior glenohumeral instability found in many throwing athletes and emphasizes the importance of proper mechanics throughout the entire kinematic chain. Fleisig GS. The Biomechanics of Baseball Pitching. Doctoral Thesis. University of Alabama 1994. The arm cocking phase can be defined as the beginning of lead foot contact and ends at maximum shoulder external rotation. A substantial amount of kinetic energy is transmitted to the shoulder, approximately 80% bodyweight, from the lower extremities and trunk rotation. Due to the circumstances the scapula and shoulder muscles are highly activated to promote and sustain movements of the shoulder, especially external rotation. Special focus to anterior instability in this phase is vital due to the high ranges of external rotation reached in this phase. In a study of pitchers with chronic anterior instability, stimulation of mechanoreceptors within the glenohumeral joint excited and/or inhibited certain muscles. The biceps brachii and supraspinatus are shown to be initiated or excited by these mechanoreceptors and assist with prevention of anterior instability. Overtime the excessive utilization of the biceps brachii could lead to a superior labrum anterior to posterior (SLAP) tear. Simultaneously the pectoralis major, subscapularis, and serratus anterior are inhibited. These muscles decelerate shoulder external rotation in this phase. When these actions cannot be preformed there is increase likelihood of anterior instability of the glenohumeral joint. The arm deceleration phase begins at ball release and ends at maximum shoulder internal rotation. Typically the concern in this phase is safely decelerating the forward progression of the arm. Escamilla et al states that a shoulder compressive force slightly greater than bodyweight is generated to resist shoulder distraction, while a posterior shear force of 40–50% of bodyweight is generated to resist shoulder anterior subluxation. Due to the high forces generated in this phase, the posterior muscles are highly susceptible to tensile overload, undersurface cuff tears, labrum and bicep pathologies, capsule injuries, and internal impingement. Olsen et al surveyed 14-20 year old baseball players to determine possible risk factors for surgery among adolescent baseball pitchers. 95 players were placed in the injured group (66 elbow, 29 shoulder injuries), and of 300 prospects contacted for the control group only 45 fit the criteria. Prior to this study the USA Baseball Medical and Safety Advisory Committee released recommendations for young pitchers: Pitch counts should be monitored, pitchers should avoid throwing breaking pitches until puberty, discourage pitching in showcases, discouraged returning to the mound after being removed from the game, pitching in more than 1 simultaneous season, or pitching in more than 9 months out of the year. Compared with the control group, the shoulder injury group pitched significantly more months of the year, innings per game, pitches per game, pitches per year, and warm-up pitches before a game. These pitchers were more frequently used as starting pitchers and pitched in more showcases. They pitched with higher velocity despite fatigue. They also used anti-inflammatory drugs more frequently to prevent an injury. 1. 5 fold increase for pitchers throwing more than 8 months per year. 2. 4 fold increase for pitchers throwing more than 80 pitches per game. 3. 2.58 fold increase for pitchers throwing 85mph or higher. 4. 36 fold increase for pitchers who threw often despite fatigue. 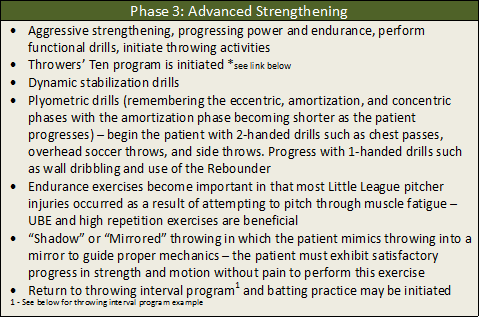 The ability to provide the best physical therapy for the throwing patient involves understanding the phases and biomechanics behind throwing. It is important to note that while these athletes are throwing with their arms, that they gain a large, important amount of momentum and force through the use of their legs and torso. 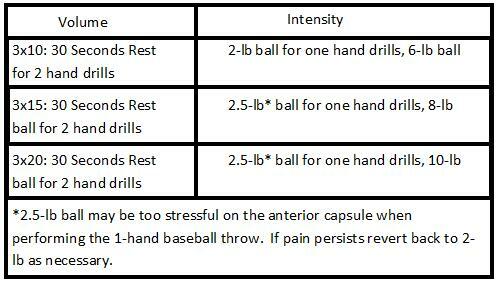 This section will mostly pertain to the upper extremity's influence on throwing. There is inconclusive evidence as to whether or not glenohumeral external rotation during the earlier phases of throwing (such as stride foot contact) has a positive or negative impact on throwing kinematics or injury occurrence. Some studies claim that increased external rotation increases the risk for injury while others refute the same statement. It is hypothesized that total amount of external rotation at the glenohumeral joint (PROM) may be predictive of increased throwing velocity and increased risk for injury at the glenoid labrum and/or rotator cuff, especially when the loss of internal rotation exceeds the gained external rotation. It is possible that the mechanism for labral tear is caused by the deceleration force imposed by the biceps tendon's attachment to the superior labrum. The presentation of a thrower’s shoulder can be quite complex in that it can present with pain, loss of performance, or deficits in strength and/or range of motion. In order to properly assess and evaluate a thrower’s shoulder an understanding of physical characteristics and clinical presentation is necessary. A structured approach in assessing a thrower’s shoulder is both efficient and effective. The components of this approach should include the assessment of range of motion, joint and/or ligamentous laxity, osseous adaptation, muscle strength, posture and scapular position. Athletes with throwing injuries typically present with an increase in shoulder external rotation and a decrease in shoulder internal rotation. The decrease in shoulder internal rotation can be further defined as glenohumeral (GH) internal rotation deficit (GIRD). Ranges of motion for an overhead throwing athlete’s shoulder vary from researcher to researcher. External Rotation can range actively at 90o abduction from 118o to 141o and passively at 136.9o. Internal rotation was commonly found at 40.1o. Total motion, which is the combination of external and internal rotation, was found to be approximately equal on both the throwing and non-throwing shoulder of professional baseball pitchers. This indicates that although motion was lost in one direction it was gained in the opposite direction. Changes in the tissue structure of the anterior capsule of the GH joint is theorized to be the greatest contributor to increase in shoulder external rotation. The hypermobility seen in throwing athletes has been further defined as “thrower’s laxity” which signifies the laxity present in the anterior and inferior capsule of the GH joint. Controversially, research has also shown posterior capsule laxity in throwing athletes without anterior capsule issues and mixed deficits in range of motion. Due to the circumstances there is no definitive conclusion that anterior capsule laxity is the exclusive reason for hypermobility at the shoulder. The osseous adaption most notably seen in a throwing athlete is an increase in retroversion of the humeral head in the glenoid. The retroversion angle of the humeral head can be configured by subtracting the angle of the transepicondylar axis, with respect to the horizontal, from the angle of the humeral head axis, with respect to the horizontal. An increase in retroversion of the humeral head has demonstrated an increase in shoulder external rotation and a decrease in shoulder internal rotation. Chant et al theorized that a larger angle in retroversion of the humeral head would constitute an increase in shoulder external rotation prior to the anterior capsule and GH ligaments. The decrease in shoulder internal rotation could be attributed to contacting the posterior capsule sooner. Whiteley et al concludes the increase retroversion could actually be a natural assistance to the large ranges of motion reached by throwing athletes. Common strength deficits demonstrated by throwing athletes are weak shoulder external rotators and strong shoulder internal rotators and adductors. Unilateral muscle ratio at the shoulder and more specifically antagonist-agonist muscle strength ratio have been utilized to assess muscle balance necessary at the shoulder to maintain dynamic stabilization. 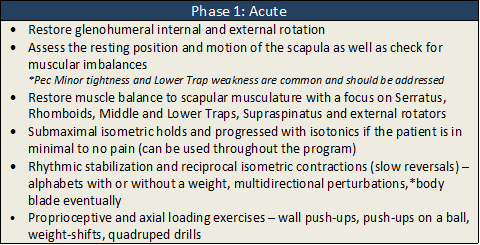 The muscle strength ratios which need special attention are the external/internal rotation muscle ratio and the scapular protractor/retractor and elevator/depressor muscle ratio. These muscle groups have shown the greatest muscle activity in EMG studies during all phases of throwing and contribute to mobility and stability of both the humerus and scapula. Wilk et al concludes that in order to maintain stability during throwing movements the external rotators would have to constitute 65% of the strength of the internal rotators which is near the optimal 66 to 75%. Studies have shown an increase in scapula protractors, elevators, and depressors in throwing position baseball players as compared to non-throwing positions. The scapula plays an important role throughout any movement of the arm especially with overhead throwing. A common issue faced with throwing athletes is scapular dyskinesis which is the alteration in motion of the scapula during coupled scapulohumeral movements. Specifically a syndrome known as “SICK” scapula is faced by throwing athletes who have postural issues that essentially maligns the scapula. The signs and symptoms are as follows, most notably is the asymmetrical dropped scapula, an inferior medial border prominence, coracoid pain and mal-position, and dyskinesis of scapular movement such as anterior tilting of the scapula causing a decrease in shoulder internal rotation. The physical examination of an overhead throwing athlete should involve a thorough upper quarter examination that includes the joints above and below the shoulder. The injuries incurred by these athletes are wide-ranging, requiring an in depth evaluation to tease out the pathology. The basis of the examniation should involve: observation, palpation, range of motion assessment, flexibility testing, manual muscle testing, joint accessory motion, and special tests. Comparisons should be made between the involved and uninvolved shoulders looking for hypertrophy or atrophy of muscles as well total ranges of motion. Due to the tremendous involvement of the shoulder girdle, examinations of the the overhead thrower should investigate scapulothoracic rhythm as well as the individual motions at the AC, SC, and GH joints. The anterior, inferior, and posterior portions of the joint capsule must be evaluated to determine whether a hyper or hypomobility is present. 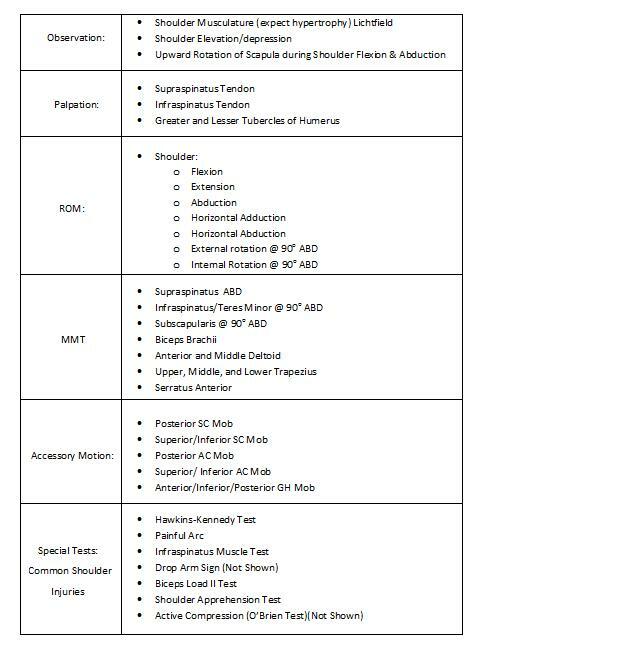 The following chart gives an itemized examination of the key points of the physical examination. A lower quarter examination is imperative for these athletes as well. Decreased knee flexion from stride foot contact through the release phase has been correlated with higher pitching velocities, so adequate knee strength and stability should be addressed. Optimal hip alignment has not been established in that it varies depending on what type of pitch is thrown and the type of delivery used by the pitcher. 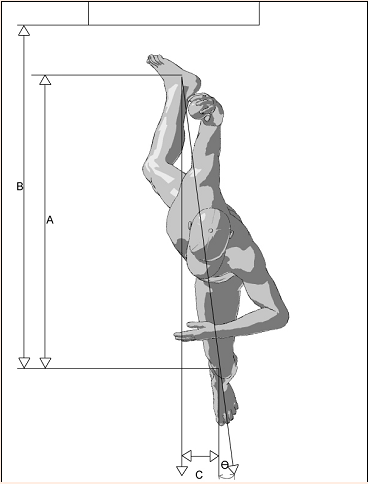 However, the stability, flexibility, strength, and endurance of the hip musculature (including the low back and abdomen) must be assessed for the examination to be adequate and ensure that the thrower is stable from the bottom-up to prevent shoulder or even elbow injuries. NSAID & Corticosteroid Injection: These pharmacotherapies are utilized mainly in the initial periods of shoulder pathology in order to decrease pain and inflammation. The use of NSAIDs is recommended initially in combination with a physical rehabilitation prescription and thermal agents. If the athlete does not respond well to this combination of treatment then an intra-articular corticosteroid injection may be considered alongside continued therapy. Corticosteroids have been shown to be effective for short-term pain reduction for sub-acromial impingement and rotator cuff tendonitis but demonstrate poor long-term pain reduction and continued function. It should be noted that corticosteroid injections have been known to cause adverse events such as transient pain after injection (10.7%) and skin alterations (4.0%) in addition to deleterious connective tissue effects with repeated use. Historically, corticosteroid injections may be selected over NSAID use based upon time of season and demand of the player to perform. Therapeutic consideration of the involved tissues should lead treatment and decisions of return to play as ROM and strength are properly restored. Imaging Concerns: Failure to demonstrate marked progress by 3 months or return to asymptomatic competition by 6 months necessitates imaging if not already obtained. Additionally, if suspicion of a more notable dysfunction or mechanical abnormality presents then clear imaging is warranted. In younger throwing athletes, especially pitchers ages 13-16, radiographic images may be useful to rule out a stress fracture to the proximal humeral epiphysis. Termed “Little Leaguer’s” Syndrome, this pathology may present with lateral shoulder pain usually only with hard throwing motions but may progress to include a dull pain at rest. Adequate rest from sport followed by progressive rotator cuff strengthening and a return-to-throwing program has demonstrated good outcomes for this condition. The radiographic evidence of humeral torsion (retrotorsion) in the dominant arm of the throwing athlete is a normal and benign finding regardless of age, gender, or sport. Such presence has actually demonstrated advantageous mechanical efficiency and may account for partial contralateral limb rotational measurement differences. Imaging may be useful to detect osseous changes or osteophyte formation, especially in the older throwing athlete due to repetitive trauma. This condition typically responds well to supervised rehabilitation but may require surgical excision if conservative treatment proves ineffective (see Internal Impingement). Imaging is also used to detect type and severity of other conditions such as SLAP lesions, Rotator Cuff lesions, and Rotator Cuff Tears. SLAP Lesions: Of the four main categories of SLAP lesions, throwing athletes typically present with a Type II tear which includes a full or partial detachment of the biceps brachii tendon from the superior labral attachment in addition to labrum involvement. This injury results from repeated tensile and torsion forces from external rotation in the late cocking phase as well as the eccentric biceps brachii contraction through deceleration. Type II & IV SLAP tears often do not respond well to physical therapy or corticosteroid injection. Arthroscopic debridement and reattachment via suture is the preferred method of repair with successful outcomes and return to prior-level competition ranging from 70-87% for throwing athletes and greater than 90% success for the general population. A supervised physical rehabilitation plan is critical for full recovery following surgical SLAP repair. Rotator Cuff Lesions: Injury to the rotator cuff muscles or the bicipital tendon may be due to primary or secondary impingement of the subacromial structures. Although primary impingement is rare in throwing athletes, both conditions typically respond well to conservative therapy. The most common mechanisms for secondary impingement of rotator cuff muscles is joint instability and laxity, most often involving lack of adequate scapular control. Surgical examination and debridement of the involved tissues for this condition is indicated only after failed attempts at proper conservative therapy as there is not strong evidence to support surgery for this condition. Rotator Cuff Tears: Full or partial thickness tears of the rotator cuff should attempt no less than two bouts of physical therapy to the complete shoulder complex followed by an interval throwing program. Corticosteroid injection may then be administered as a viable trial. Current research demonstrates very poor return to play outcomes for throwing athletes who undergo surgical intervention for full rotator cuff tears, especially baseball pitchers. Neither arthroscopic nor mini-open repairs resulted in acceptable outcomes for full-thickness repairs in baseball players with only 15% and 8% of athletes returning to play, respectively. Acute Traumatic Instability: Although the majority of pathologies related to the dominant shoulder in the throwing athlete are categorized as overuse or damage resultant from repetitive trauma, the occurrence of acute traumatic instability or dislocation most often indicates surgical management. Recurrent dislocation rates have been found as high has 94.5% with young athletes who undergo nonoperative treatment versus 4% with operation. Arthroscopic surgery using absorbable sutures has not been shown to be of significantly greater benefit than non-absorbable sutures. Please refer to this Physiopedia link for surgical information on shoulder Internal Impingement. Pitchers have the option of throwing from "The Stretch" or "The Wind-up" positions. It is important for them to be comfortable with both deliveries and for both to be mechanically similar during the follow-through phase. "The Stretch" vs. "The Wind-up"
Wilk, Meister, and Andrews define 4 phases to the rehab of the throwing athlete: Acute, Intermediate, Advanced Strengthening, and Return-to-Throwing. They also discuss more specific rehab principles for common injuries to overhead throwing athletes. These rehab specifics will be illustrated in the following charts. The throwers ten exercise programme is a long sanding series of exercises designed to prepare the shoulder for throwing (related videos and PDFs). 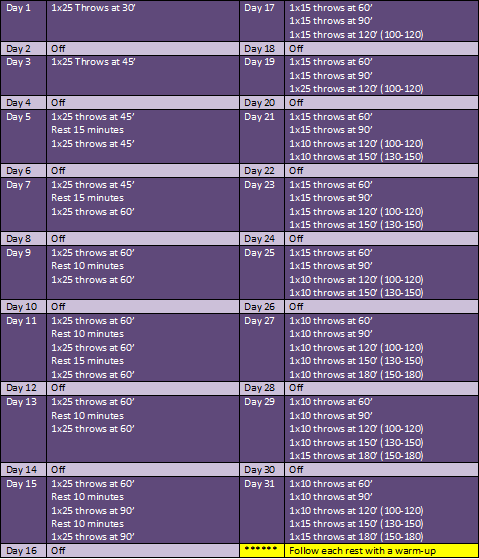 An extension to the standard thrower's ten exercise programme has been proposed by Wilk et al 2011. Youtube video demonstrating the Throwers Ten exercise programme. • These 7 exercises were chosen based on the EMG results from a group of 12 showing a greater than 20% maximal voluntary isometric contraction of at least 11 of the 13 tested shoulder muscles. The ballistic six exercises were developed to reproduce the conditions under which the shoulder girdle musculature must act to control the head of the humerus on the glenoid during the overhead throwing motion. The sets, reps, and progression of the ballistic six training regimen was developed to follow the SAID principle of progressive resistance exercise and also to tax the anaerobic and aerobic systems of the pitcher in a similar pattern to that of a baseball game. Exercises 1,2,4,5,6 are performed unilaterally while exercise 3 is to be performed with both hands. Whiteley's review entitled: "Baseball throwing mechanics as they relate to pathology and performance - A review," does an exceptional job relating the biomechanics of throwing to physical therapy based on the research of over 100 articles. Physical therapists can use this information to educate the athlete and their coaches to better protect and/or rehabilitate throwing athletes. In the article: “Risk Factors For Elbow And Shoulder Injuries In Adolescent Baseball Pitchers,” Olsen et al focused on the little clinical evidence surrounding current safety recommendations for little league pitchers. By doing a retrospective survey they were able to identify four significant risk factors surrounding adolescent pitchers who required elbow or shoulder surgery versus those who didn’t. Identification of these factors can help little league coaches and associations determine rules and regulations to further protect adolescent pitchers. The purpose of the article: “Shoulder Injuries in the Overhead Athlete,” is to discuss the physical characteristics of the overhead athlete, common pathologies, and the non-operative, surgical, and postoperative treatment. It was found that the thrower’s shoulder must be lax enough to allow excessive external rotation but stable enough to prevent symptomatic humeral head subluxations, thus requiring a delicate balance between mobility and functional stability. They determined frequently, injuries can be successfully treated with a well-structured and carefully implemented non-operative rehabilitation program. ChrisOleary.com Review of Pitching Mechanics. This site has nice images and media related to faulty pitching mechanics. Throwers generate massive amounts of force through highly skillful and intricate movements of the shoulder. Despite the meticulous research into the biomechanics of throwers and the forces exerted on surrounding tissues, a lack of high level evidence into therapeutic interventions exists. Current evidence necessitates performing a comprehensive examination to differentially diagnose the multiple deficiencies that may result from the substantial repetitive forces on the shoulder complex of a thrower. NONOPERATIVE TREATMENT FOR INJURIES TO THE IN-SEASON THROWING SHOULDER: A CURRENT CONCEPTS REVIEW WITH CLINICAL COMMENTARY. ↑ Whiteley R. Baseball Throwing Mechanics as They Relate to Pathology and Performance – A Review. J Sports Sci Med 2007 6:1-20. ↑ 3.0 3.1 3.2 3.3 3.4 3.5 3.6 3.7 3.8 3.9 Escamilla R, Andrews JR. Shoulder Muscle Recruitment Patterns and Biomechanics during Upper Extremity Sports. Sports Med 2009; 39 (7): 569-590. ↑ 4.0 4.1 Fleisig GS. The Biomechanics of Baseball Pitching. Doctoral Thesis. University of Alabama 1994. ↑ 5.0 5.1 5.2 5.3 5.4 5.5 5.6 5.7 5.8 5.9 Whiteley R. Baseball Throwing Mechanics as They Relate to Pathology and Performance – A Review. J Sports Sci Med 2007 6:1-20. ↑ Chant CB,Litchfield R, Griffin S, Thain LM. Humeral Head Retroversion in Competitive Baseball Players and Its Relationship to Glenohumeral Rotation Range of Motion. J Orthop Sports Phys Ther 2007;37(9):514–520. ↑ 8.0 8.1 8.2 8.3 Wilk KE, Meister K, Andrews JR. Current Concepts in the Rehabilitation of the Overhead Throwing Athlete. Am J Sports Med 2002 30:136. ↑ 9.0 9.1 9.2 9.3 9.4 9.5 Flynn T, Cleland J, Whitman J. Users' Guide To The Musculoskeletal Examaniation: Fundamentals for the Evidence Based Clinician. Kentuckt: Evidence in Motion; 2008. ↑ 18.0 18.1 18.2 18.3 18.4 Meister K. Injuries to the Shoulder in the Throwing Athlete: Part Two: Evaluation/Treatment. Am J Sports Med 2000 28:587. ↑ 19.0 19.1 Gaujoux-Viala C, Dougados M, Gossec L. Efficacy and safety of steroid injections for shoulder and elbow tendonitis: a meta-analysis of randomised controlled trials. Annals of the Rheumatic Diseases. 2009;68(12):1843-1849. ↑ Whiteley RJ, Ginn KA, Nicholson LL, Adams RD. Sports Participation and Humeral Torsion. JOSPT. 2009;39(4):256-263. ↑ Wilk KE, Reinold MM, Dugas JR, Arrigo CA, Moser MW, Andrews JR. Current Concepts in the Recognition and Treatment of Superior Labral (SLAP) Lesions. JOSPT. 2005;35(5):273-291. ↑ Dodson CC, Altchek DW. SLAP Lesions: An Update on Recognition and Treatment. JOSPT. 2009;39(2):71-80. ↑ Coghlan JA, Buchbinder R, Green S, Johnston RV, Bell SN. Surgery for rotator cuff disease. Cochrane Database of Systematic Reviews 2008,Issue 1. Art. No. : CD005619. DOI: 10.1002/14651858.CD005619.pub2. ↑ Mazoue CG, Andrews JR. Repair of Full-Thickness Rotator Cuff Tears in Professional Baseball Players. The American Journal of Sports Medicine. 2006;34(2):182-9. ↑ Wilk KE, Yenchak AJ, Arrigo CA, Andrews JR. 2011, The Advanced Throwers Ten Exercise Program: a new exercise series for enhanced dynamic shoulder control in the overhead throwing athlete. Phys Sportsmed. 2011 Nov;39(4):90-7. ↑ Lyman S, Fleisig GS, Andrews JR, Osinski ED. Effect of Pitch Type, Pitch Count, and Pitching Mechanics on Risk of Elbow and Shoulder Pain in Youth Baseball Pitchers. Am J Sports Med 2002 30:463. ↑ Myers J. et al. On The Field Resistance-Tubing Exercises For Throwers: An Electromyographic Analysis. Journal of Athletic Training. 2005; 40(1): 15-22. ↑ 30.0 30.1 30.2 Pretz R. “Ballistic Six” Plyometric Training For The Overhead Throwing Athlete. Strength and Conditioning Journal. 2004; 26(6): 62-66.